The content of this article provides interesting history, facts and information about the usurper Emperor Domitius Alexander and the all-powerful Caesars who ruled the empire of Ancient Rome. "The usurper Emperor of Africa..."
Short Biography profile and facts about one of the most famous Romans of all, in the life of Domitius Alexander , Emperor of Rome and provinces of the Roman Empire. Obtain a fast overview of the times of the Roman Emperor Domitius Alexander from the following facts and information about his life. Domitius Alexander was was vicarius of Africa (a vicarius held the position of a governor of a diocese, and was responsible for a number of provinces, each province with its own governor). Domitius became embroiled in the power play between the joint Emperors Galerius and Maxentius. Maxentius seeking the support of Domitius Alexander demanded his loyalty and that his son should be sent to Rome as a hostage. Domitius Alexander refused and his troops proclaimed him Emperor in 308AD. Emperor Maxentius sent his praetorian prefect (praefectus praetorio) Rufius Volusianus and Zenas who was (paucissimis cohortibus) to put down the rebellion and Domitius Alexander. 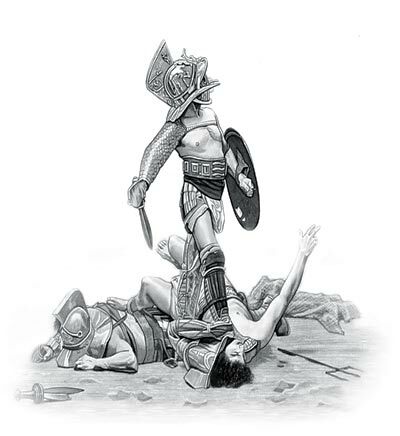 His armies were defeated and Domitius Alexander was taken prisoner and executed. The content of this Domitius Alexander category in the Emperors of Ancient Rome provides free educational details, facts and information for reference and research for schools, colleges and homework. Refer to the Colosseum Sitemap for a comprehensive search on interesting different categories containing the history, facts and information about the lives and people of Ancient Rome.